Shake Shack is a go. We expect to file for building permit next week, to begin construction later this month or in early July and to open the restaurant in the fall. Construction is estimated to take 4 months. “This took us a lot more time than we expected, and cost substantially more than we thought it would. We did not prove to the satisfaction of the ZBA [Zoning Board of Appeals] at the first hearing that there was a hardship. “Candidly, we simply looked at the fact that H&L [Chevrolet] had received a variance years ago for a similar sign, under the same regulations, and given what we perceived as the similarities in the properties locationally and otherwise, we thought it was a simple argument. “ZBA does not work like the P&Z [Planning & Zoning] Commission, they are really strict enforcers of the existing regulations. The second time we went forward (last night), with more detailed information and a more clear explanation of the request, they were very constructive as a commission. Shake Shack’s signs were approved by the Darien Zoning Board of Appeals on Wednesday night — but the board approved a sign for the front of the building only 20 inches high. That’s 2 inches less than what the restaurant chain had asked for. Will Shake Shack accept the shorter sign and open a restaurant at 1340 Post Road? They’ve walked away before when the ZBA indicated the Shake Shack signage proposal needed to be reduced. The latest rendering of what the Shake Shack building and its signs would look like at 1340 Post Road. Developer David Genovese, who recruited Shake Shack to come to town and advocated for approval before the ZBA and other town land-use boards, said he didn’t know how Shake Shack would react, but he hoped so. Genovese, principal at Baywater Properties, which owns the land, said he’d ask Shake Shack officials on Thursday. Representatives from the restaurant had walked away from the proposal when the ZBA rejected a previous application. Genovese said at the time that he was told company officials thought they had compromised enough in shrinking their signage, and they didn’t want to give another inch. Now, the ZBA says they need to give two inches. Applicants who want a variation from town zoning regulations are supposed to show the board that they have specific circumstances beyond their control that make the zoning regulations a burden on the business. The board is then supposed to use its judgment to grant the least leeway necessary to fix the situation. Attorney Robert Maslan of Darien, representing Baywater Properties and Shake Shack, argued that name signs and logos larger than zoning regulations allow should be permitted on the front of the building and on the side because there are various barriers blocking the view of the property for westbound drivers on the Post Road. Those problems include: a “low bridge” sign put up by the state to warn truckers about the low railroad bridge underpass downtown; the Pawprint Market building, which blocks the view of the Shake Shack building because it’s eight feet closer to the road than current zoning regulations allow (it appears to have been built before the regulations were put in place) and at least one tree on the Pawprint lot that blocks the view. Several ZBA members said they were persuaded by Maslan’s points. A signage expert hired by Baywater Properties — Richard Crawford of Mercer Sign Consultants in Doylestown, Pa. — spoke at the public hearing to explain his recommendation that the signs should be at least as large as Shake Shack was requesting. A signage expert hired by the commission to get a second opinion also spoke to explain his written recommendation that a legal case that there was a hardship specific to the site had not been shown to justify larger signs. That second expert — Donald Poland of Goman + York Property Advisors in East Hartford — wound up saying that he largely agreed with the first expert that larger signs would be a good idea. When Maslan was asked if he wanted to question the ZBA’s expert, he declined. Crawford gave written statements to the board members explaining further how he calculated from the legal speed limit on that part of the road, how much opportunity drivers would have to notice signs big enough to be readable, to read them, to decide quickly whether to turn in the parking lot of the restaurant and then to do so. Keeping the signage letters no higher than 10 inches would be unsafe, he said. Planning & Zoning Commission member John Sini attended the meeting and told the board that the P&Z wanted to review the town’s signage regulations, but the commission has so much work in front of it that it just hasn’t had the time. As only one member of the P&Z, Sini said, “I don’t want to speak for my board,” but he also said, “There’s definitely a willingness […] if you go back to the record, it’s very clear what our intention has been.” He seemed to indicate that he expected the P&Z to loosen the signage size regulations. ZBA Chair Gary Greene asked Sini what his feeling was about the signage-size application. “You think it’s a no-brainer?” Greene asked. The state’s low-bridge sign had been installed at the town’s request to help with an important safety problem of trucks getting stuck in the railroad underpass downtown, she said. After the public hearing was closed, ZBA member Charles Deluca said he thought Sini’s statement indicated the P&Z would change the regulations anyway, which helped Deluca decide to support the application. ZBA member Jeffrey Williams mentioned that P&Z Chair Susan Cameron had made a statement which strongly supported the ZBA carefully reviewing the Shake Shack application to make sure a hardship had been demonstrated. When the ZBA closed the public hearing and began discussing the matter, three members initially said they were comfortable enough with the 22-inch-high sign requested in the application. Two others — Jeffrey Williams and Victor Capellupo — said they were more comfortable with the 20-inch sign that the board’s own expert had suggested. However, Capellupo said he could be “talked into” supporting 22 inches, and Williams said it would be fine if the board let the applicant have that height. But then one of the three supporters of the 22 inches, board member Charles Deluca, said he’d rather support the 20-inch sign, which Williams had just pointed out appeared to be the minimally necessary adjustment, according to the board’s own hired expert, Poland. Deluca introduced a motion to make it 20 inches, shifting the majority on the five-member board to that position, and the rest of the board members decided to make it unanimous. In the short discussion, every single member of the board changed his mind (or at least his vote) at least once. It now remains to be seen whether or not the Shake Shack officials who walked away from the application before, saying they’d compromised as far as they could, will accept it now — agreeing to a 2-inch difference that two experts gave vague justifications for and that all five board members waivered on. Darien either gets a Shake Shack — the most popular proposal for a restaurant in town, perhaps ever — or doesn’t, based on those two inches. Zoning Bd of Appeals 6-1-16 from Darien TV79 on Vimeo. Is five or six stories just too high for a Darien building, even downtown? Or will those buildings loom less over downtown and nearby homes than some fear? 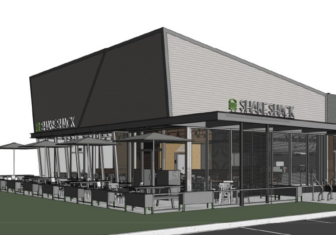 Shake Shack's application to open a restaurant on the Post Road received unanimous approval from the Darien Planning & Zoning Commission Tuesday, but the major hurdle before another crucial town board recently got higher. The P&Z voted unanimously to approve the restaurant's application to open a restaurant at 1340 Post Road, the former site of Chuck's Steak House. Shake Shack's "Darien Shack" opens at 11 a.m. Monday (with limited parking and an expectation that traffic will be high for a little while after it opens), but here's a first look inside from an invitation-only event on Friday at the 1340 Post Road location: Andrea Keefe, manager of peer-to-peer programs at the Hole in the Wall Gang foundation started by Paul Newman was on hand promoting the nonprofit's new partnership with Shake Shack in Connecticut. For every "Pie Oh My" dessert sold at the Darien store, for instance, Hole in the Wall Gang gets a 5 percent contribution from Shake Shack, and the organization has similar arrangements with the other two Shake Shacks in Connecticut (in Westport and New Haven).